Cross-Enterprise Document Sharing (XDS) is an interoperability profile that facilitates the registration, distribution and access across health enterprises of patient electronic health records. A Document Repository is responsible for storing documents in a transparent, secure, reliable and persistent manner and responding to document retrieval requests. 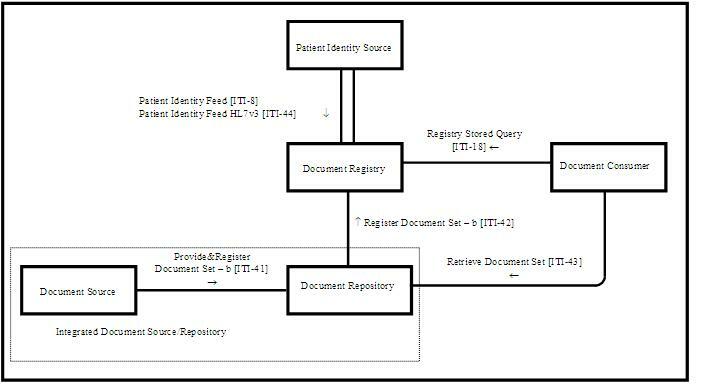 A Document Registry is responsible for storing information about those documents so that the documents of interest for the care of a patient may be easily found, selected and retrieved irrespective of the repository where they are actually stored. facilitates the registration, distribution and access across health enterprises of patient electronic health records. focused on providing a standards-based specification for managing the sharing of documents between any healthcare enterprise, ranging from a private physician office to a clinic to an acute care in-patient facility. assumes that the enterprises belong to one or more XDS Affinity Domains. An XDS Affinity Domain is a group of healthcare enterprises that have agreed to work together using a common set of policies and share a common infrastructure. Community of Care supported by a regional health information organizations in order to serve all patients in a given region. The concept of a document in XDS is not limited to textual information. As XDS is document content neutral, any type of clinical information without regard to content and representation is supported. This makes the XDS IHE Integration Profile equally able to handle documents containing simple text, formatted text (e.g., HL7 CDA Release 1), images (e.g., DICOM) or structured and vocabulary coded clinical information (e.g., CDA Release 2, CCR, CEN ENV 13606, DICOM SR). In order to ensure the necessary interoperability between the document sources and the document consumers, the XDS Affinity Domain must adopt policies concerning document format, structure and content. This is not normative text, but provided informatively due to the frequency that questions are asked. The FindDocuments query has 17 query parameters, but 7 of them play a critical role. These parameters are the “critical few”, especially for the initial query that performs the primary filtering (further discussed in Section 3.4) among all available documents for a patient that may be in the thousands with a mature deployment. This primary filtering optimizes the use of query to return the best possible results, avoiding missing any results that should be considered. This favors false-positives (results that are not desired), over false-negatives (missed results). The query results returned include full metadata for each entry found; local refinement of these results (see section 2.2 below) is used to further eliminate these false-positives. The other 12 parameters may also be used, but the effectiveness of these additional parameters in primary filtering is limited. See section 2.1.2 for further explanation. patientId - this is required in XDS/XCA. You must have a Patient ID you are interested in. Use of PIX, PDQ, XCPD, or some other Patient Identity Management system is a prerequisite, that will not be further discussed in this handbook. classCode – classCode is used to group documents into logical classes which are useful to primary filtering success. A small number of controlled value set of pre-negotiated code values should be defined to group documents into broad logical 'classifications', designed so that for any use case where someone is looking for documents they can pick one term from this value set. practiceSettingCode - this is the clinical specialty where the act that resulted in the document was performed. Like the classCode, this should have been filled with a controlled value set of pre-negotiated code values that represents broad classifications of clinical specialties. By restricting the value set to the high-level clinical specialties, one should avoid the misfiling associated with documents produced by sub-specialties. serviceStartTime - serviceStopTime – When there is a timerange of the service event that you are interested, you will query against the serviceStartTime and service StopTime metadata element to find documents that indicate they fit your timerange. . The service times are specific to the time range of the treatment or episode. This is different than the document creation time, which is when the document was created. The query results will return any document whose “service time” falls within that range. It is important to note that these parameters work together to give a period of time. Given you are interested in a specific time range (Start -> Stop). Some DocumentEntries will have neither service start or stop. These will be returned regardless of any timeframe query parameters. Your Community Metadata Specification should encourage all metadata publications populate the serviceStartTime and serviceStopTime element as much as possible to avoid false-positive query results. Enterprise-wide information systems that manage a patient’s Electronic Health Record, such as a Hospital Information System. XDS Purchasing describes considerations when purchasing equipment to deploy this Profile. The XDS FAQ answers typical questions about what the Profile does. XDS Implementation provides additional information about implementing this Profile in software. Where in the World is CDA and XDS? Medical Data GRIDs as approach towards secure cross enterprise document sharing (based on IHE XDS). Current: IT Infrastructure Technical Framework. This page was last modified on 25 July 2018, at 14:57.